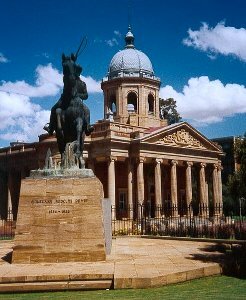 Bloemfontein flights booked on this page qualify to earn exclusive SouthAfrica.TO travel vouchers. Simply email a writeup of any flight to cheapflights@southafrica.to and we'll send you vouchers. Easy! 4 February 2015. Bloemfontein has moved into decline : 3.5% fewer passengers flew to Bloemfontein Airport in December 2014 than in December 2013. This is however better than in November when the decline was at 4%. Bloemfontein is close to nothing, but in the middle of everything (as that 90s ad goes, it's in the centre, Mr Venter!). 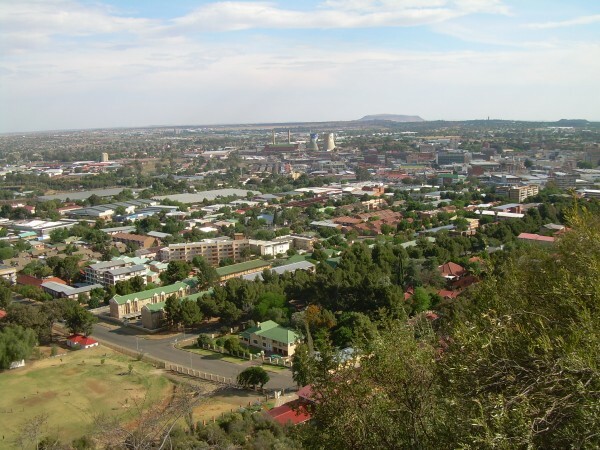 Bloemfontein is the most central city in South Africa: as the bird flies it is 471km between Durban and Bloemfontein, 380km between Johannesburg and Bloemfontein and the longest flight is the 909km between Cape Town and Bloemfontein. The long distance between Bloemfontein and Cape Town explains why it is the only flight route to Bloem with a low cost carrier (Mango Airlines). A lot of people choose to drive from Johannesburg to BFN, rather than fly. Unless you're flying in one of Mango's B737-800s, expect to be flying in a smaller plane, and possibly even a turboprop. Bram Fischer International Airport, the new name of Bloemfontein Airport, is situated in Tibbie Visser Street. The airport's IATA code is BFN. There is public transportation from BFN, as well as plenty of car rental agencies at Bloemfontein Airport (Budget, Europcar, Avis, Hertz, First & Tempest). Most people opt for the convenience of hiring a car. Except in rush-hour traffic, you should be able to get to just about anywhere in Bloemfontein within 20 minutes of leaving the airport. To get to, for instance, the Protea Hotel Bloemfontein; head southeast from the airport, turn right onto the N8, turn left onto Nelson Mandela Road, make a U-turn at DF Malherbe Avenue, and you will see the Protea Hotel on your left. Even though you're travelling from one end of the city to the other, it takes only 15 minutes to cover the 13km. On the 2nd November 2012 the renaming of Bloemfontein International Airport to Bram Fischer International Airport was gazetted, after being proposed by Ms. Dorcas Khewa of Chris Hani (in Bloemfontein) on the 10th October 2011. On the 13th of December 2012 there was an official function celebrating the renaming. Here is the speech from President Zuma on the renaming to Bram Fischer International Airport. "Today is a special day in the history of the Mangaung metropole and the whole of South Africa, in that, in a space of a few hours we honour two great statesmen and remarkable freedom-fighters who were comrades in arms and were together in the trenches fighting for the liberation of our country. We are today immortalizing once more the names of Bram Fischer and Nelson Mandela. Later this afternoon we will unveil a statue of President Nelson Mandela here in the city of Mangaung. We will be able to yet again pay tribute to a man who became a symbol of both our struggle for freedom and the free and democratic South Africa. As we meet, Madiba is recuperating from a lung infection at a Pretoria hospital. We wish him a speedy recovery and assure him yet again, of the love and support of many in the country and abroad. It is befitting that we now unveil another equally important monument, named after Bram Fischer, a peer of former President Mandela, and one of the central figures for the defence during the Rivonia Treason Trial. One of the most unique features of our struggle is its nonracial nature. Many around the world never understood how white compatriots who believed in human rights and justice, such as Comrade Bram Fischer, sacrificed their privileges as they could not accept that other human beings could be treated inhumanely. Abram Louis Fischer (Bram) came from an eminent Afrikaner family, which was highly respected because his grandfather Abraham Fischer whom he was named after, had been a Prime Minister of the Orange River Colony and later a member of the cabinet when the Union of South Africa was formed. His father Percy Fischer was a Judge President of the Orange Free State. Because of his family history and background Bram Fischer was destined for great things within the Afrikaner community. President Mandela made a remarkable observation when he said: "Even his political opponents would agree with us his comrades that Bram Fischer could have become prime minister or the chief justice of South Africa if he had chosen to follow the narrow path of Afrikaner nationalism. He chose instead the long and hard road to freedom not only for himself but for all of us. He chose the road that had to pass through the jail. He travelled it with courage and dignity. He served as an example to many who followed him." Indeed Bram Fischer chose a path different from that of his parents. He understood very well that he could not be entirely free unless and until the rest of South Africa was free. As former President Mandela described him, Bram Fischer was "an Afrikaner whose conscience forced him to reject his own heritage and be ostracized by his own people, who showed a level of courage and sacrifice that was in a class by itself." On this centenary year of the organization he loved so much, the ANC, we are honoured to name the entry point by air to Mangaung, after this national hero. Current and future generations will draw lessons from the life of Bram Fischer and his selfless contribution to this country. By naming this Airport after this great son of Mangaung and South Africa, we are advancing our programme of building monuments and creating new symbols that are reflective of our shared heritage and destiny as South Africans. It appears Justice Rumpff, who had been on the opposite side of Bram Fischer during one of the many Treason Trials, knew exactly what contribution Bram Fischer would make to our heritage and history, when he said about Bram Fischer at his funeral: "You know what, ... he'll be remembered long after you and I are forgotten." Given our historical experience, all of us have a responsibility to do all we can to free the South African society of the anguish, the pain and the degradation of the past. It is therefore one of the key responsibilities of government to build a country which all South Africans can call home. As government, we are charged with the responsibility of engendering a sense of unity, common nationhood, a genuine feeling that we are all one nation, one people, united in our diversity, as our Constitution enjoins us. On this historic day, we say to Bram Fischer and to his generation of freedom fighters: Thank you for pioneering our struggle for liberation. Thank you for showing us the way to freedom. And thank you for keeping the dream of a united, non-racial, non sexist, democratic, free and prosperous South Africa alive. We have to work harder to take that vision forward. Indeed the SACP tribute to Bram Fischer way back remains relevant. "Comrade Fischer died as he lived: an example of the highest dedication to the cause of freedom and social emancipation regardless of personal cost." Let this renamed airport stand as a timeless reminder of the role Bram Fischer and his generation of freedom fighters played in the history of our struggle for liberation. Compatriots, ladies and gentlemen, It is my honour and privilege to declare Bram Fischer Airport officially open! I thank you." "One of the most abiding memories of the entire visit would be the friendliness and politeness of the students we met everywhere." "We detoured to the top of Naval Hill to obtain a view of the town and to my surprise came upon a giraffe leisurely munching on the leaves of a tree."